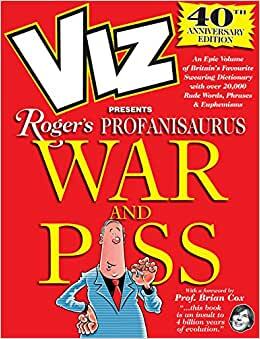 Celebrating Viz's 40th Anniversary, War and Piss brings together for the first time every single entry from Roger's Profanisaurus, the constantly-growing dictionary of swearing. Viz Comic is Britain's third or fourth funniest magazine. Possibly fifth. Its blend of cartoons, features and joke adverts appear every five weeks on the newsstands, and selections of the best bits can be found 24/7 on www.viz.co.uk for anyone too cheap to buy it. The readers are pretty special too: 70% have been reading the magazine for 10 or more years 89% are male with an average age of 41 55% are educated to Degree level and above 70% have more than one other person who reads their copy 68% don't read any other magazine!